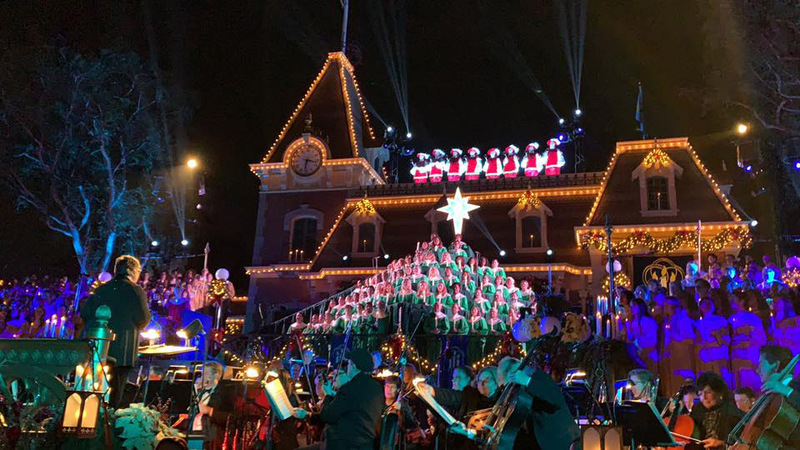 A cool but dry Main Street, U.S.A. was the setting for the 2018 Candlelight processional this weekend at Disneyland, after a predicted rainstorm failed to materialize. Actor Chris Pratt, Star-Lord in the Guardians of the Galaxy films, was the celebrity narrator for all four weekend performances. Pratt read from the traditional script used in recent Candlelight performances, but ad-libbed a few lines throughout. 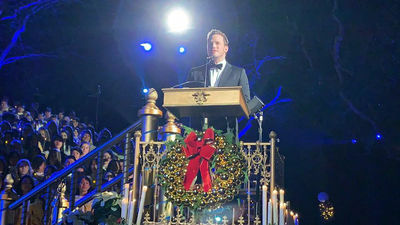 "Guardians of the Galaxy" star Chris Pratt narrates Candlelight Processional at Disneyland. Photo courtesy of KC Pal. Pratt took a moment at the conclusion of Saturday's first performance to speak about the love of a parent for their child. "The way we love our children, and the more we love our children, the more we will understand the capacity for our father in heaven to love us." He concluded his remarks saying, "This holiday season, let us embrace every one of our tomorrows with hope and love and through this holiday spirit may we continue to spread peace and good will throughout the world." 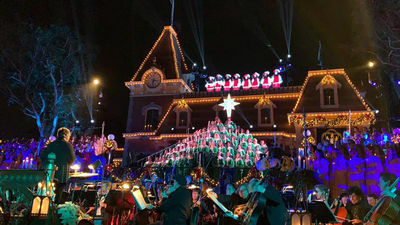 The Main Street train station serves as the stage and backdrop for the Candlelight Processional at Disneyland. Photo courtesy of KC Pal. Disneyland’s Candlelight Ceremony with Chris Pratt - December 1, 2018. YouTube video by DAPS MAGIC. Disneyland has filed for a permit to install a temporary riser for a World of Color media event. The permit did not include any dates or additional details, but it's a good sign for fans of the show. We expect Disney to make an announcement about the show this week, now that the permit is public. Disney Vacation Club members, if you missed November's Moonlight Magic event at Disney California Adventure, there's another opportunity to enjoy an after-hours party at Disneyland in January. The next event is Thursday, January 31, 2019 at Disneyland park. The free after-hours event lets members stay in the theme park after it closes to day guests, and enjoy character meet-and-greets, complimentary snacks and shorter wait times for select rides. Time is yet to be announced, but expect mix-in access to begin two to three hours before the park closes, and for the event to run until around midnight. Reservations are required, and will begin at 8:00 a.m. (Pacific) on Tuesday, December 18, 2018. Be prepared with your member number when you log onto the event website, and expect to wait in a virtual queue for up to an hour to secure your spot. ...Disney has filed a building permit for a new five-level elevator for the Mickey and Friends parking structure. This is a long-overdue improvement for the 10,000-space parking structure, which currently has just two elevators for use by the public. ...Fresh candy canes are available at Disneyland's Candy Palace this Monday, Wednesday and Friday, and at Trolley Treats in Disney California Adventure this Tuesday, Thursday and Saturday. ...Tickets are still available for both of the Disneyland After Dark events that went on sale last week. Tickets for each event are $99 per person, and can be purchased through the event website or in person at Disneyland ticket booths. Parking is not included in the event fee. Haunted Mansion Holiday – closes January 7, 2019 to remove holiday overlay. No repoening date announced. Astro Orbitor – closes January 7 for refurbishment. No reopening date announced. World of Color – closed for refurbishment. The show was scheduled to return on June 22, but Disney has announced an "extended refurbishment" for the show, and says it will return in late 2018. Grizzly River Run – closes January 7 for refurbishment. No reopening date announced. Wetzel's Pretzels – closed for refurbishment. No reopening date announced. Napolini – closed for refurbishment through December 15. Moonlight Magic at Disneyland – Thursday, January 31. Exclusive event for DVC members and guests. Reservations begin at 8:00 a.m. (Pacific) on Tuesday, December 18, 2018. Be prepared with your member number when you log onto the event website, and expect to wait in a virtual queue for up to an hour to secure your spot. Disneyland After Dark: Sweethearts Nite – Thursday, February 7. Tickets available through the event website. Disneyland After Dark: 90s Nite – Thursday, March 6. Tickets available through the event website. D23 Expo – August 23–25, 2019. Tickets on sale now via the event website. Disneyland prices as of June 1, 2018. Premier Annual Passport ($1,579) – valid at both Disneyland Resort and Florida's Walt Disney World Resort; includes parking and digital PhotoPass downloads. No blockout dates. Disney Signature Plus Pass ($1,149) – includes discounts, parking, digital PhotoPass downloads and MaxPass. No blockout dates. Disney Signature Pass ($999) – includes discounts and parking. Digital PhotoPass downloads are included only for renewing passholders who had the benefit on their original pass; new purchases do not include this benefit. Some blockout dates, including December holidays and other peak days. Disney Deluxe Pass ($729) – includes some discounts. Some blockout dates, including December holidays and other peak days. Park-specific blockout dates apply to all passes purchased, renewed or activated after June 2, 2018. Southern California Annual Passport ($549) – includes some discounts. Many blockout dates, including Saturdays, December holidays and other peak days. Park-specific blockout dates apply to all passes purchased, renewed or activated after June 2, 2018. Southern California Select Annual Passport ($369) – includes some discounts. This pass has the most blockout dates, including all weekends, December holidays and other peak days. Park-specific blockout dates apply to all passes purchased, renewed or activated after June 2, 2018. Southern California CityPASS ($353/$324) – includes a 3-Day Disneyland Resort Park Hopper Bonus Ticket (including one early-entry day), a one-day admission to Sea World San Diego, and a one-day admission to LEGOLAND California. The CityPASS expires 14 days after first use at any location, and the first use must occur by December 31, 2018. Purchase CityPASS through the Disneyland website or on-site at the ticket booths of Disneyland Resort or the other theme parks included in the pass. You can also purchase directly from the CityPASS website, though a shipping charge may apply depending on how quickly you need the ticket. When you purchase the CityPASS, you have the option of adding a one-day admission to either San Diego Zoo or San Diego Safari Park for an extra $44/$36. This upgraded pass is only available for purchase directly from the CityPASS website. Add a second day at LEGOLAND for $25. Purchase this upgrade at LEGOLAND on the day you use your CityPASS. Add LEGOLAND Water Park for $30 for ages 3+ ($5 for ages 2 and under). Purchase this upgrade at LEGOLAND on the day you use your CityPASS. Upgrade your Disneyland ticket to another ticket or annual passport of equal or greater value. For the current Southern California CityPASS, a credit of $330 for ages 10+ ($314 for ages 3-9) will be applied toward another ticket of equal or greater value. Purchase the upgrade at Disneyland before the end of your third visit. Prices listed above are subject to change without notice. Character Dining Vouchers – discounted character dining vouchers are available for purchase on line, in advance of your trip, through Get Away Travel. Disneyland Resort merchandise – Disneyland has once again extended the additional 20 percent merchandise discount offered to Disney Signature Plus, Disney Signature, Disney Premier and Premium annual passholders, this time through December 31, 2018. All other passholders receive a 10 percent merchandise discount. Visit the Annual Passholder discount page for specific details and exclusions. Disneyland tickets may be used through December 19, 2018. There are no remaining blockout dates for 2018. Active and retired U.S. military personnel can purchase Disney Military Promotional Tickets for themselves and up to five additional family members or friends. No more than six Disney Military Promotional Tickets may be purchased by any eligible member of the U.S. military (or spouse) pursuant to this offer. All tickets and options are non-transferable and must be used by December 19, 2018. This offer is valid most nights from January 1 through December 19, 2018. There are no further blockout dates in 2018. Eligible service members can purchase the Photopass Collection for $49 plus tax through December 19, 2018. The package includes digital downloads of all PhotoPass photos in the user's account when they redeem the voucher; a voucher for a dining print package, and a Disneyland photo disc with 350 stock photos from around the Disneyland Resort.